You have successfully subscribed, thank you. 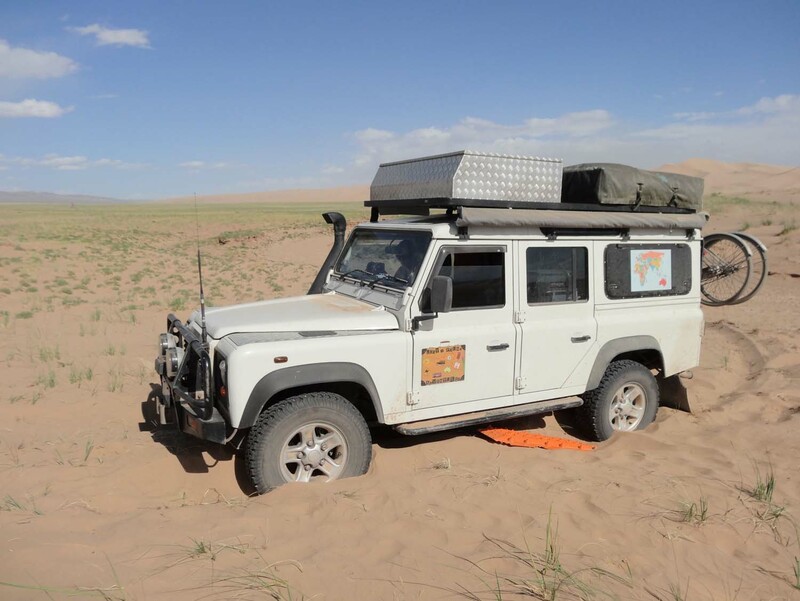 Whilst trying to get out of a very soft section of sand in the Gobi desert, there was an ominous crunch from somewhere in Lara’s transmission… The engine kept running smoothly, but we lost all drive. Our first thoughts were that we had blown the clutch. 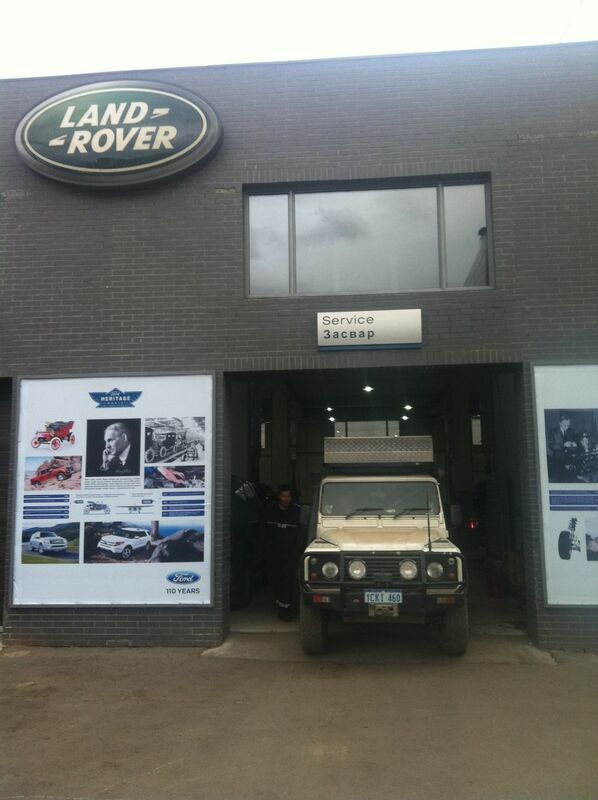 We looked at each other with quite a bit of fear in our eyes as we were about 150km from the nearest small town and a lot further from Ulaanbaatar where we knew there was a Land Rover garage. As ever in Mongolia, a moment later a motorbike appeared out of nowhere and with our best sherades we think he went off to find us a tow. Not wanting to give up we tried a few things and realised if we ‘locked’ the differential we could drive. This made us think we had broken a half shaft in the front axle. 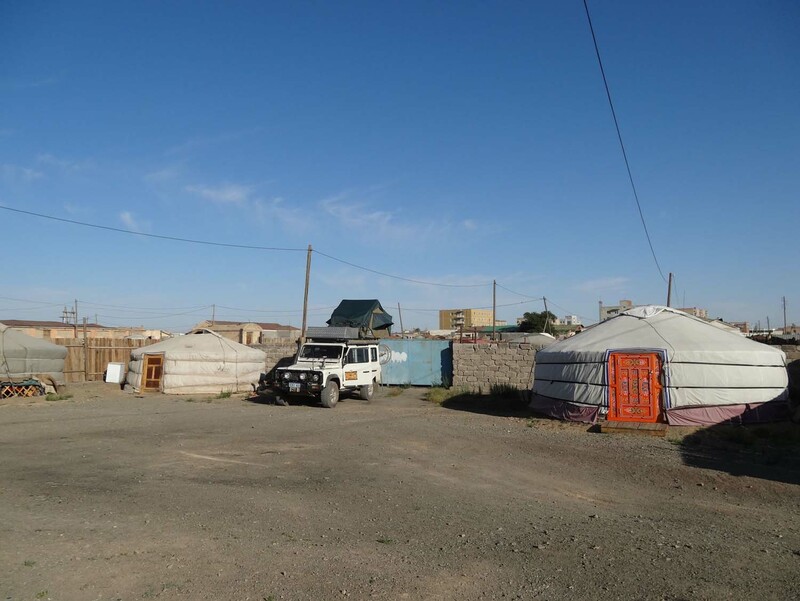 Now mobile, albeit 2WD only, we set off back to the little town of Dalanzadgad, 150km away on very corrugated tracks. 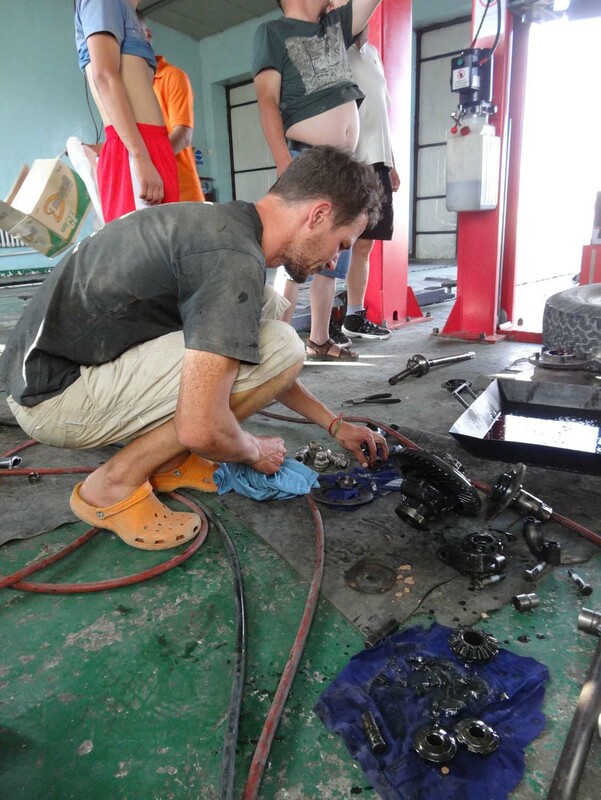 After a while we hear metal grinding noises from the front axle, so we stop to remove the front prop shaft. This proved almost impossible as one of the bolts had a stripped thread! With the help of a local driver and a lot of swearing later, the prop shaft was finally removed and we could move on again. By this time it had started to go dark, but we wanted to keep going (slowly) as we didn’t know if the garage in Dalanzadgad would be open on a Saturday. The next day was Friday and we were hoping to get into Dalanzadgad around lunch time. We drive until 1.30AM and camp by the side of the road. The next morning we set off around 8.30AM and were looking good until yet another painful sound started from the front axle, limiting us to 19km/hr… Only 45km to Dalanzadgad and the tracks were finally getting a little better and we couldn’t go any faster… Around 3PM we finally limped into Dalanzadgad and a friendly local told us to follow him to the garage. After waiting a few hours whilst locals jumped the queue, we got in and the front axle was stripped down. This was done with the help of a local who spoke some English and also had his car in the garage, translating for us. The first drive shaft came out in one piece and, to our surprise, the second came out in one piece too. By this time it is late and we are expecting them to kick us out and tell us to come back tomorrow. But no, they keep working until 8PM when they manage to get the differential out: this is what we damaged – badly. A lot of cogs had been smashed, but luckily the axle casing was in one piece. it’s a good thing we are carrying the workshop manual! 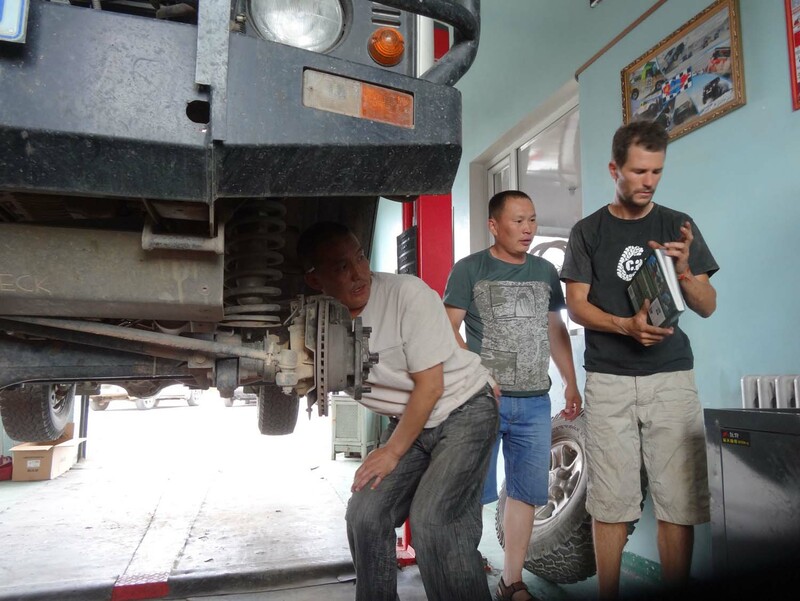 They put it back together for us and we all assumed we could start our drive to Ulaanbaatar in the morning with the car in 2WD. However, as we drive out of the garage, a new and very ominous grinding sound appears from underneath Lara! 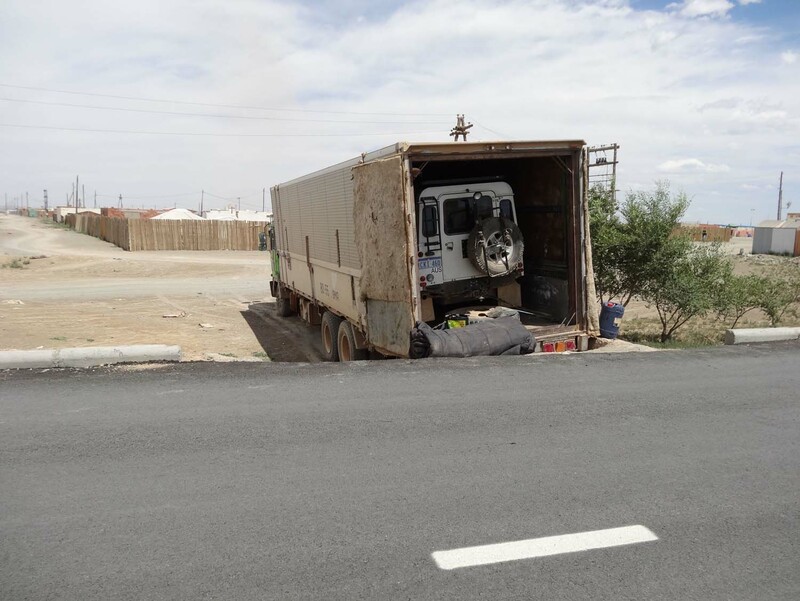 They put her back on the lift again to have another look, but nothing obvious is visible so we decide to call it a day and camp in their ger compound for the night. 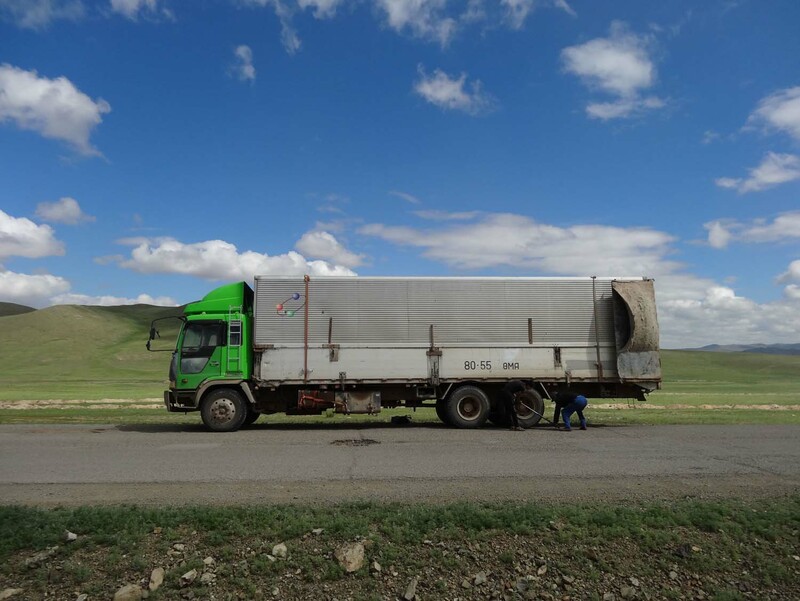 They call a truck for us who will pick us up tomorrow morning and start the long drive to Ulaanbaatar. 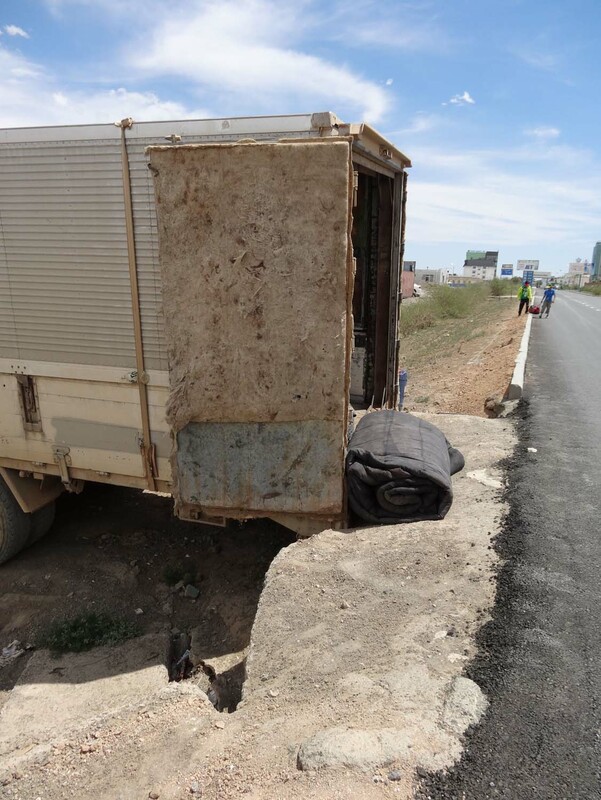 It’s difficult loading a Land Rover into a grocery truck without ramps, but they have an innovative solution: backup the massive truck into a creek bed crossing under the main road allowing us to drive the car in! The truck was late, we had to strip off the roof tent and roof box to make Lara fit and it took us an age to convince them to tie Lara down (they don’t tie-down Mars bars and Coke apparently), meaning it wasn’t until 2.30PM that we were on the road with the father and son team driving. The road was terrible, and we had to frequently stop to re-tie Lara who was bouncing around more than we would have liked as the straps kept coming loose. 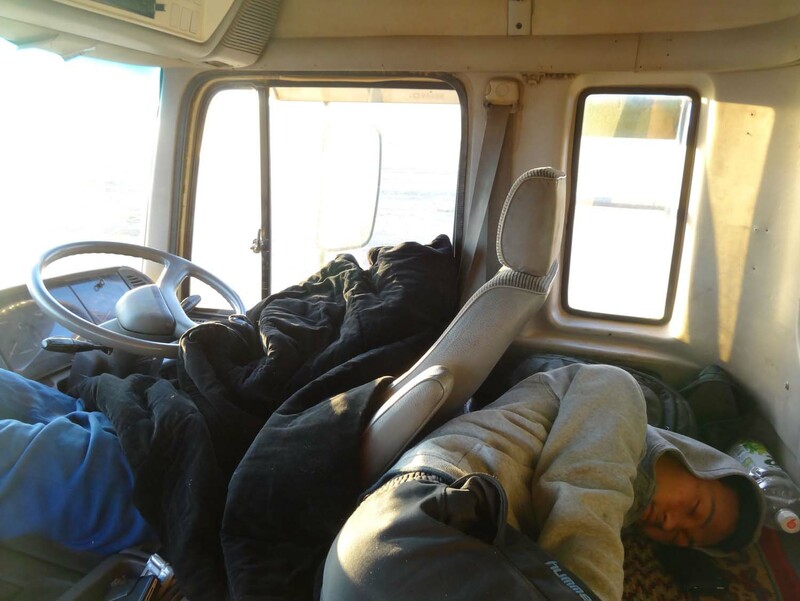 We drove until 2AM again when we persuaded Bashka to pull over for some sleep as he was falling asleep behind the wheel. We didn’t know how long they would sleep for and settled down for a night with them in the cabin. There wasn’t enough space and without blankets it certainly wasn’t warm either so we woke up early and had our breakfast and cuppa tea. They finally woke up just before 9AM and weren’t interested in breakfast, just another cigarette. They didn’t stop for food until lunch time. 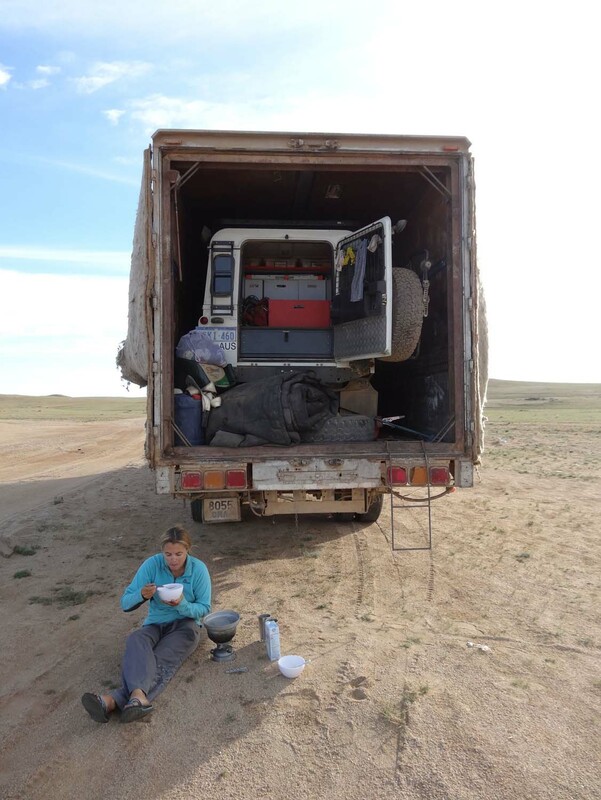 After what seemed an eternity on corrugated roads, dozens of stops to check on Lara and one truck puncture, we finally completed to 550km trip, arriving in Ulaanbaatar at about 6PM. But now we still had to get her out of that truck! Nearly 2 hours later a tilt tray truck arrives and Lara is finally released from her prison. Once on the ground we put the tent and roof box back on and we are then driven to the Land Rover garage by this smaller truck. Even though it is Sunday night 10PM when we get there, the guard lets us in and Ian (our saving angel) picks us up and generously offers us a bed in his apartment! Ian is the brother of a good friend of Marjolein and saved the day! using a tilt tray truck to get Lara out, a bit dodgy. We had to back up the big truck into a ditch to make it work. The next morning they start work on Lara and before we order the new differential we want to make sure nothing else is damaged. 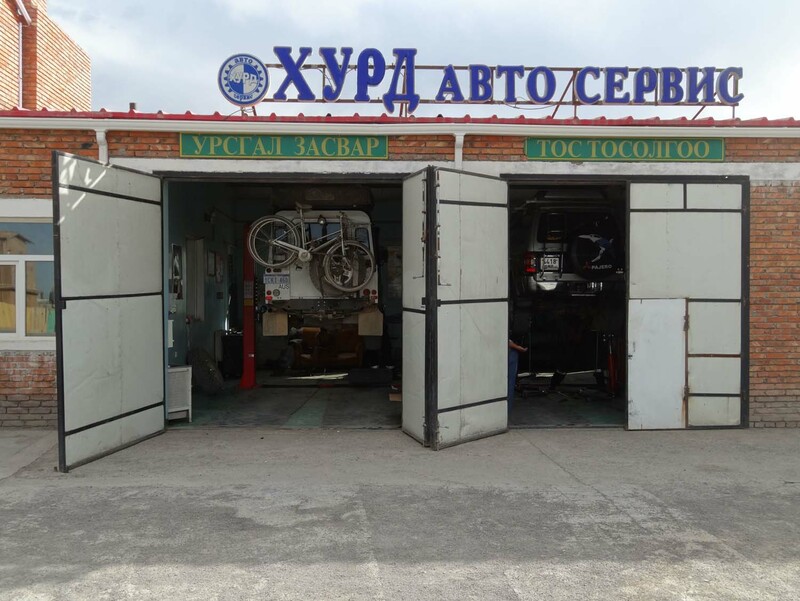 They promise us they will have her driving out of the garage on Tuesday evening before the garage shuts for Naadam, the annual festival. The transfer box (4WD bit), gearbox and clutch all have to come out and be stripped and checked. Tuesday night 3AM (!) they give up, but promise us they will get back to it on Wednesday, their day off…! Amazing (I guess we’ll feel the pain when the bill is presented)! 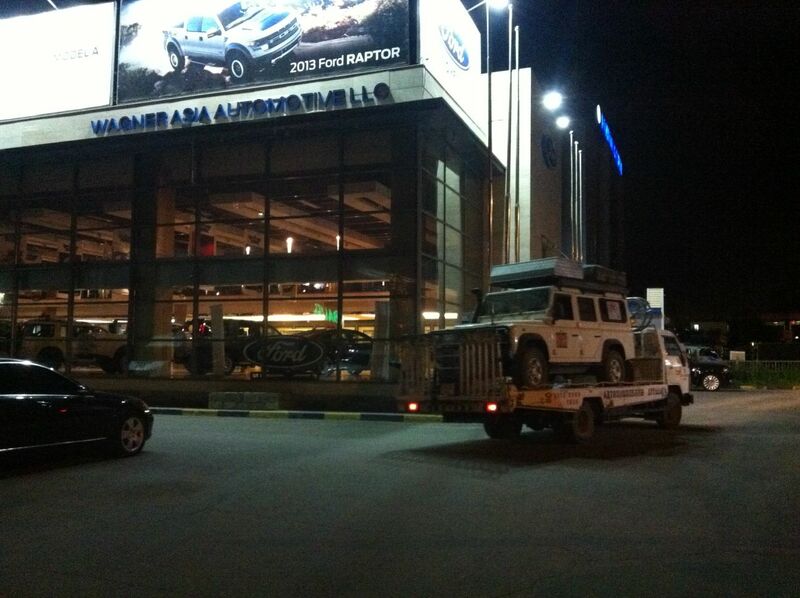 The next day they finish around 8PM and Lara is finally back on the road, albeit 2WD only, and we order the differential from the UK. 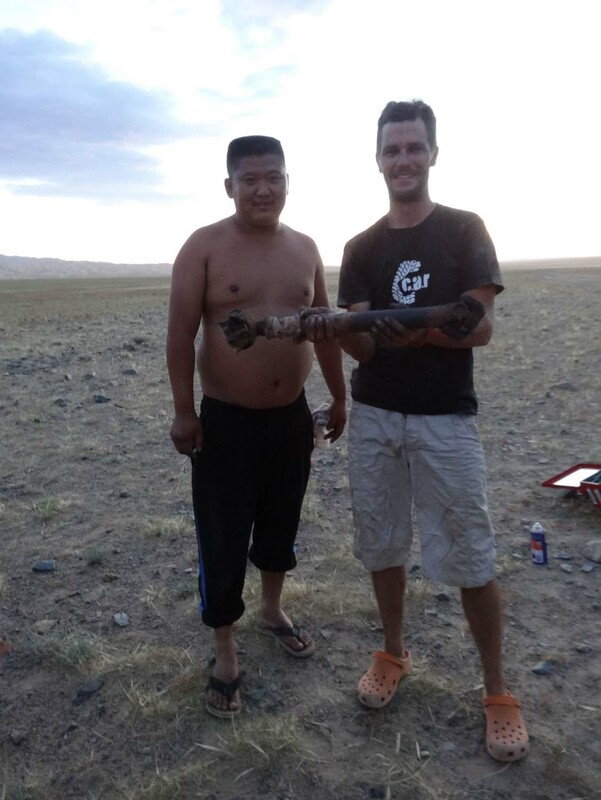 This was on Wednesday and we are now tracking our TNT parcel number, willing it to go faster, whilst enjoying the wresting, archery and horse racing events of the Naadam Festival and of course Ian’s fantastic hospitality! And as we have been able to spend some time behind the computer, we have finally added some route maps to the country pages for those of you interested where we went in each country! Check out our routes in Malaysia, Thailand, Cambodia, Laos and China. As we don’t know the ending to this story yet, you’ll have to be patient (like us). In the mean time we will keep you entertained with the rest of the Chinese adventures, and any donations will be gratefully received (we have bank accounts in the UK, The Netherlands and Australia to make it as easy as possible for you…). PS Those of you who think they have won Jon’s work competition where Lara would break down, please send in a copy of your original estimate. We will announce the winner in one of the next blog posts! PS. Nice to see the picture back up. Maybe there are a few LandRover graveyards where you can source a 2nd hand diff as a fall back in case the Belgians don’t manage to get the diff shifted? I sympathise with your plight but am amazed at how you can go from a totally busted car in the middle of nowhere to a proper LandRover garage who know what they’re doing. Great how people are so willing to help. Hope you get her sorted and fully functional soon. Thanks Phil! It is still supposed to arrive this Thursday… fingers crossed! 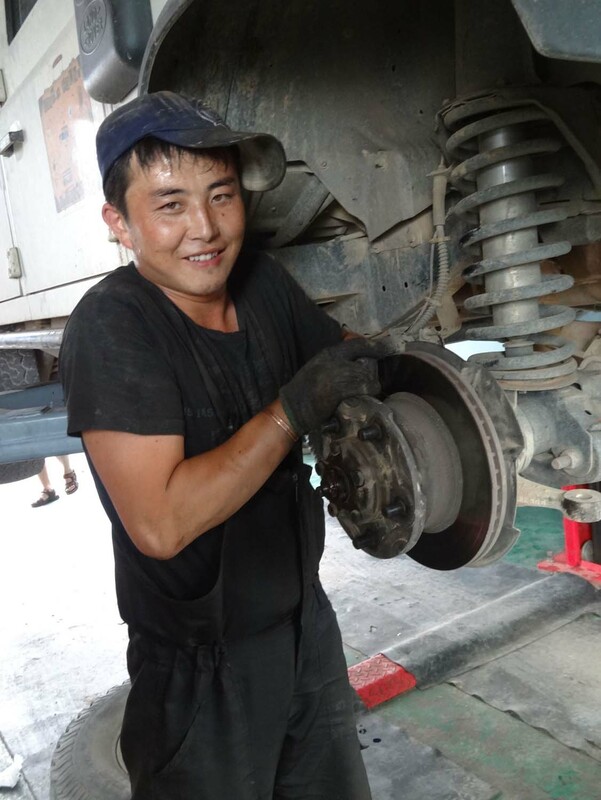 And yes, the Mongolians are amazingly friendly and helpful people! Loving Mongolia and glad the pictures are all working again! Did you check the old posts too? Should be fine as well now. Trust that the new diff arrives soon and ‘Lara’ feels much much better. Good news that you were able to access one – bad news that it happened, but I guess you had to expect something to break at some stage! Trust that it doesn’t break the bank too much. 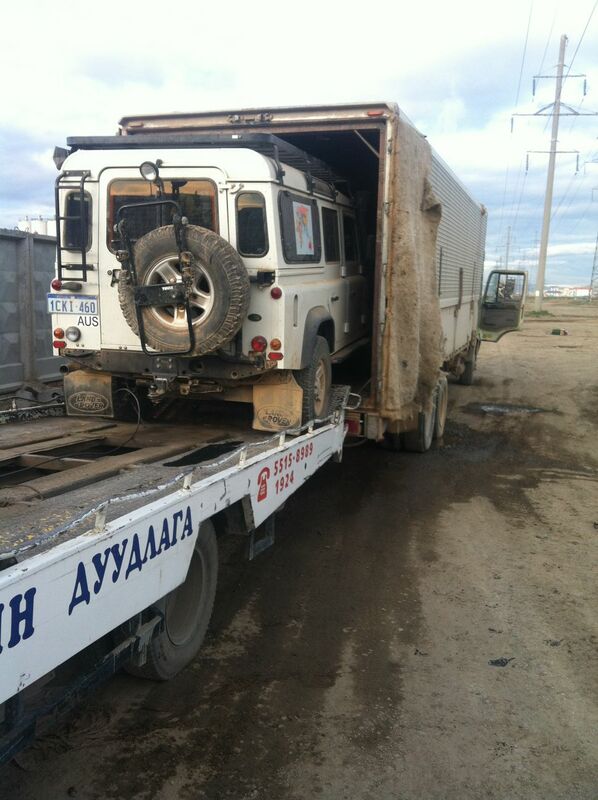 thanks guys, we’re still hoping it will arrive this week… and will post an update when we’re on the (4wd) road again! Sounds like a true adventure, but good to hear it has a positive ending. Certainly something you will remember and hopefully you can love about in some weeks/months. Waiting with bated breathe, wishing for the best final outcome!! holy! good luck. and i think i have problems with a rattle in the dash that won’t go away, and my garage is just across the road from work. Thanks guys! We’ll let you know when we have some (hopefully) good news… Right now the new diff has been sitting in Belgium for 3 days, not moving… Not helpfull! Glad to hear your nightmare ended well. Nightmare hasn’t ended yet unfortunately… We don’t know yet if she will be ok with new diff and the new diff has been delayed by 2 days already… Hasn’t moved from Belgium in nearly 3 days yet… We’ll update once we know more and she is driving with 4 wheels without loss of power again!